HI MT! :D First of all: HAPPY NEW YEAR 2006! To receive the new year I introduce my first wallie for 2006! 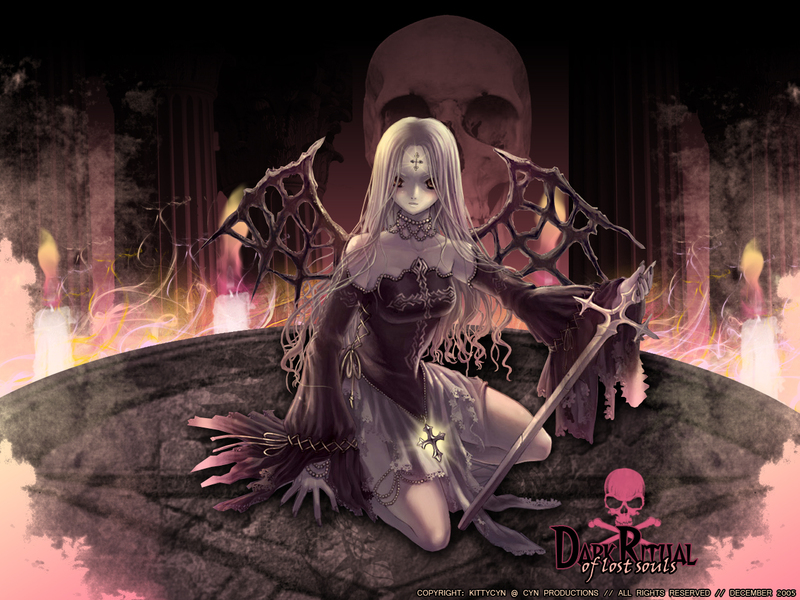 "Dark Ritual [of lost souls]"
Ummm...the scenery developes in a monastere or a cava in which the girl is the dark witch who begins the ritual...candles, smoke, lighing effects, skulls, can be seen in the BG. On the other hand, I vary a little bit my fav color palette to yellow and pink ones XD I thought I must use the same colors that were found in the original scan :) They all looked really well together to change them. I really like how it turned out :) hope you like it too ^^ Remember to comment please, I really like to read your comments! Oh my ^^ *loves it* What great wallpaper. The bg looks amazing and I really love this dark atmosphere. Wow, it's quite nice. I love the color...great work! Wow. Looks great! I really like the skull and the dark feel of it all. Um, a suggestion. It's nice that it's lighter than most dark wallies, but perhaps you could make it a wee bit darker. Um...darker shades of purple or pink? Looks great though. It's a change from all the gloomy and...hard to see dark wallies. Really luv. *faves* ^^ Keep it up! your work was always nice! and i love this new wall you've made, just great! i like the scan! though she looks scary! ehehe the bg is soo cool! nice candles and smokes! i like the color of the smoke! the skull behind the scan is soo scary! *hides* anyways great wallie! +fav! omg! looks kawaii! i like these dark wallys! and the art is beautiful! +fav! Really nice! Definitely dark and gothic indeed ^^ Like the candle-lit backdrop and skull. Adds a creepy feeling. Nice! wow, awesome wall! it looks so cool :) nice choice of colors! I really like your concept for this wall, a ritual taking place :o it has a nice creepy feel to it. The scan is great though I see what you mean about the extraction and cleaning, but definetely your hard work has paid off. Your choice of colors is great and even if it's yellows and pinks it still keeps the obscure vibe. The thing is that I'm not that much into the skull in the back, looks a bit too real if you know what I mean so it stands out. If dark scenes are your preferred style I'd really look forward for your future works... keep it up! Whoa, KittyCyn this wallie is pretty fine! I know this scan pretty well... I'm a fan of HM's draws and this one is one of my favorites draws from her. I also gained a gift with this scan for christmas, I really like this one. An Awesome work, but sincerely I don’t like the skull in the background and think that the candles are a little too big, but really, really, really is an awesome wallpaper. May be the logo is a little big too. well done Kitty, I REALLY DO LOVE IT! This wallpaper is very cool.The girl has a strong feature. Very Very delicious and exquisite Vampyre Lady. Ohmygoodness, this one looks so scary in thumbnail. I like the detailled work of the ritual, the candles surrounding it is rather...nice and enchanting. Nice work and keep it up~! This pic is so WRONG in all the RIGHT ways! I love it. It even scares me! Thanks so much.